First of all, I would like to thank Jim, Salena, and everyone at the Center for the Healing Arts for everything they have done for my daughter. Not only have they been patient with her, they are helping to bring her out of the world of autism. I cannot stress enough how grateful I am for my daughter having a chance at using the hyperbaric oxygen chamber at the office. HBOT has been a blessing! It is helping to bring my daughter back to us. Since starting treatments only two months ago, she is more responsive to her name, has better eye contact, and gives hugs and kisses. She is more interactive with her siblings and loves to play around with her daddy. She will pull us over to things she wants, rather than trying to get them herself. Her expressive and receptive language are a lot better too. She will follow more simple directions now. She was fully non-verbal before HBOT, but since starting, she has said a handful of new words. She has not been consistent with them, but I am confident that it will increase with further sessions. Also, many more improvements are surfacing. She has gained cognitive abilities, as well as better motor planning. She is also eating a bigger variety of healthy foods and loving them. I am not the only one seeing improvements. I have not told her school about HBOT, and now they have called me to redo her IEP early! 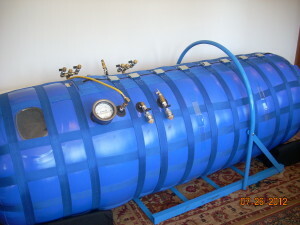 I am very excited we started HBOT. It is changing our lives for the better!